Did you know that Marco Polo brought chives back to Europe from one of his voyages to China? Europeans not only used chives in their cooking but tied them into bunches and hung them around their houses. They believed that chives had magical qualities that kept the bad spirits away and protected the people in their houses from getting sick. Chives are the smallest species of the onion family. They are not like the regular cooking onions because there is no large bulb that grows underground, so it is the leaves that impart the unique onion flavour. Chives make a perfect addition for individuals who are on diets and are watching their calories. They are fat-free and mix well with other herbs and spices as a salt substitute. Sulfur compounds have antibiotic properties. 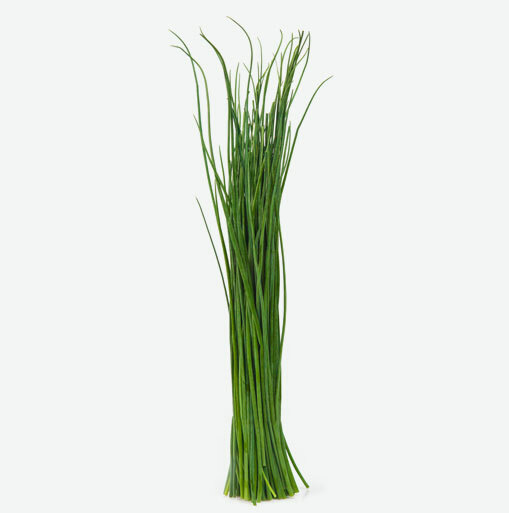 Chives are beneficial to the respiratory system, good for digestion, and act as a diuretic. Choose chives that are fresh, uniform in size, have even green leaves with no signs of wilting, yellowing or drying. Chives are also available frozen and freeze-dried for instant convenience. Store fresh chives in the refrigerator in a plastic bag for up to a week. Don’t wash them until you are ready to use them. The excessive moisture will speed up decay. Use chives raw to make the most of their delicate onion flavour. If you are cooking chives, add them at the very end just before serving. Chives make excellent garnishes and they are great for tying up small bundles of vegetables. Sprinkle chopped fresh chives into soups, salads, and stews just before serving. Add them to scrambled eggs, baked potatoes, or cream cheese. Add chives to plain yogurt for a tasty salad dressing.